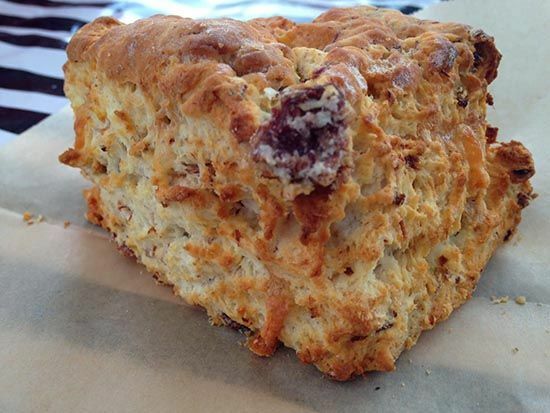 The Kilt: One of our biscuit's filled with Market House corned beef and Mt Townsend Creamery Off Kilter cheese. This aged tommette cheese is washed in Pike Brewing Company's Kilt Lifter scotch ale, so we had to add a bit off that ale to the dough as well. Organic green onions add some flavor and give the biscuit a hint of green. We add a pinch or two of horseradish as well. Not enough to clear the sinuses, just enough to boost the flavors. Sure some of the flavors are Scottish, but the overall inspiration is Irish. I am Scottish-American, but I love celebrating St. Patrick's Day. Robert Burns Day is just not the same in America. They sold out quickly last Sunday. We will make more this Sunday, but you might want to get there early if you want one. West Seattle Farmers Market 10:00 am to 2:00 pm.